Life has been very hectic as of late, but as I get closer to getting things back on track I still find time to hang out with my dogs in my back yard with a good cigar and beer. 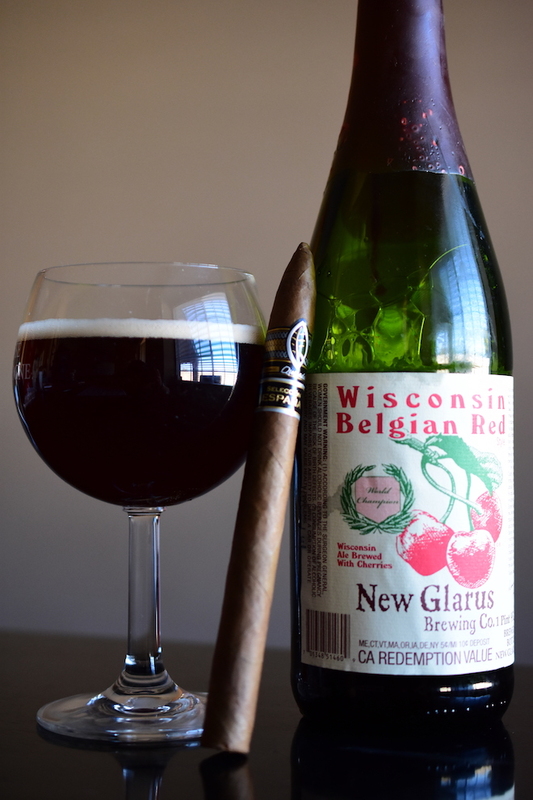 This week, we look at the Casa de Montecristo exclusive Quesada Seleccion Espana Beli-Lance paired with a bottle of New Glarus Wisconsin Belgian Red lambic. Quesada’s Seleccion Espana is no stranger to Casas Fumando as I did a blind review of the blend a few years ago, and Jeff took a run at the H-Town format a few months back. The aptly named Beli-Lance format is a Casa De Montecristo exclusive. If you haven’t already figured it out, it’s a cross breed lancero with a belicoso cap. 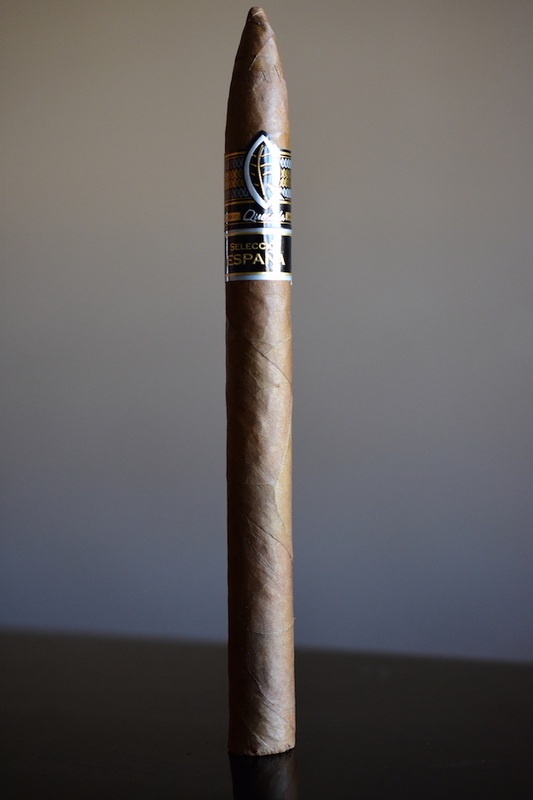 The Quesada Seleccion Espana Beli-Lance comes in one single 7 x 40 size. 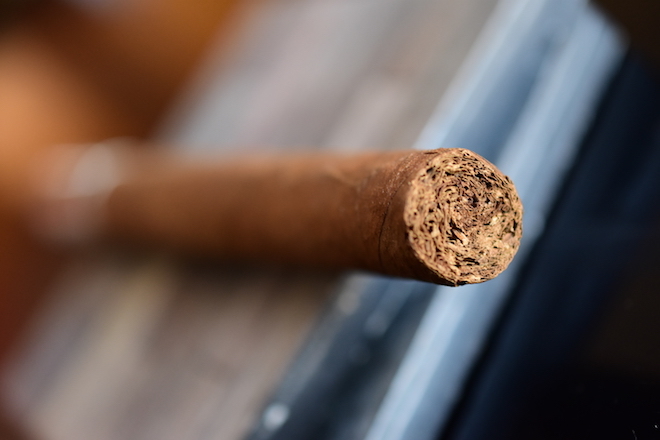 The blend starts with an Ecuadorian Arapiraca wrapper, Dominican Republic binder, and filler tobaccos from both the Dominican Republic and Nicaragua. The Quesada Seleccion Espana Beli-Lance is an extremely limited run with only 300 boxes of 10 being released for a total of only 3,000 cigars produced which run $10.95 a stick and are only available at Casa De Montecristo. Thanks to the CDM team for sending these our way. 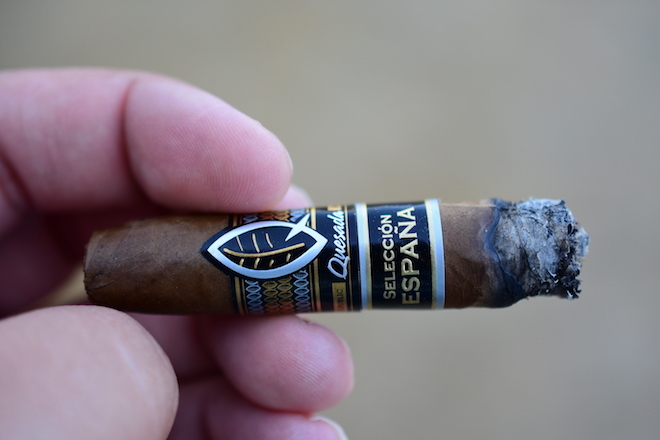 The Quesada Seleccion Espana Beli-Lance starts out with a gorgeous, rough looking wrapper. 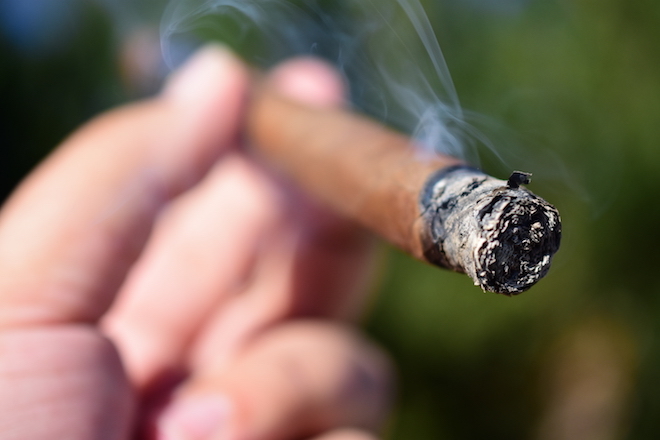 The wrapper is a medium/light brown with lots of darker and orangish areas scattered throughout the body of cigar. The texture of the wrapper carries a bit of roughness and a good amount of oils with only a few smaller veins. The Quesada Seleccion Espana Beli-Lance is packed tightly, but beware as the wrapper is very thin, and very delicate. 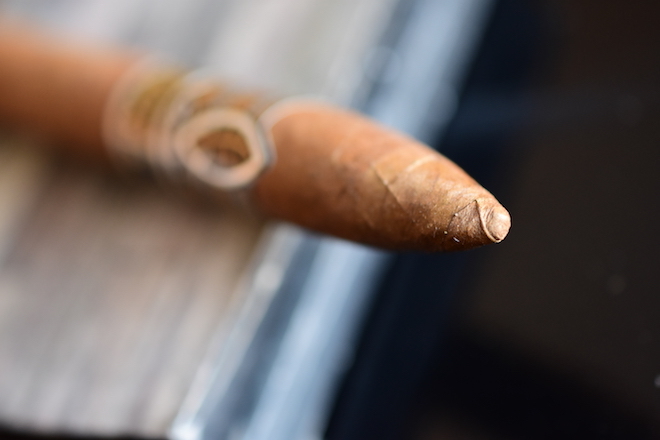 The slender body of the cigar leads up to a very sharp, very pointy belicoso style cap. The Quesada Seleccion Espana Beli-Lance is polished off with the same black, gold, and silver Quesada band and Seleccion Espana secondary band that we have all come to expect on the Espana blends. The wrapper on the Seleccion Espana gives off some great cashew, honey, and earthy aromas while the foot of the cigar carries a bit of spice and cedar. The cap cut very clean, and very easily using my Palio double bladed cutter. The Quesada Seleccion Espana Beli-Lance produces a great mixture of soft spice, nut, honey, and tobacco on the cold draw. 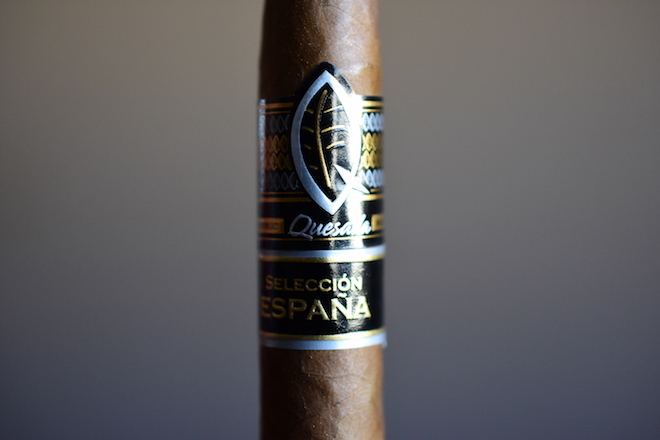 The Quesada Seleccion Espana Beli-Lance starts off with only a very slight bit of pepper which quickly faded away after the first few puffs leaving behind some strong sweet honey, cedar, cashew, and musk with some slight spice and saltiness. The draw is perfect. Each, tiny puff kicks out massive clouds of thick white smoke which linger in the air quite some time before dissipating. The Quesada Seleccion Espana Beli-Lance gives off only a small amount of stationary smoke as it rests in my ash tray. The burn line is razor thin, and dead even leaving behind a trail of tightly compacted medium gray ash which held on for an inch before giving way. Into the second third of the Quesada Seleccion Espana Beli-Lance and the body has amped up a bit to fit nicely in a medium role. The flavors are still leading with cedar, honey, cashew and musk with a good amount of spice creeping in now while the saltiness has faded out. The retrohale coats my nasal passage with some very strong cedar with a little bit of spice which really helps draw the cedar out of the flavor profile. The burn line is still dead even and I haven’t had to reach for my torch at all while I feel nothing in the nicotine department. As I venture into the final third of the Quesada Seleccion Espana Beli-Lance more and more of the cedar is starting to take over the flavor profile. While the cedar is at the forefront there are still some strong bursts of honey and cashew backed by a bit of spice and molasses. It took me about an hour and forty five minute to takes the Quesada Seleccion Espana Beli-Lance down to the nub and I experience no harshness, nor any extra heat. The cigar finished creamy with a bit of a buttery mixture towards the nub leaving me with nothing in terms of a nicotine kick. I was a big fan of Quesada’s Seleccion Espana from the first time I’ve had it. Years later, the blend is still going strong. In the case of the Beli-Lance, i think the blend preformed exceptionally well. In comparison to some of the others, the smaller ring gauge really helped draw out some of the more subtle flavors. In all honesty, this was probably one of the best formats for this blend. At least in my opinion. That being said, there probably isn’t a whole lot of these still out there. If you are a fan of the blend, a fan of Quesada, or a fan of cubanesque cigars then you should probably jump on these while you can. Again, Casa De Montecristo is the only place you can pick these up. I recommend getting a box. Or two. New Glarus is a small little brewery located in New Glarus, Wisconsin. Don’t let it’s size fool you though, New Glarus has kicked out some of the highest rated beers in America. I can’t get them here, but luckily Jeremy is only a hop away and was able to bring down a bottle of the Wisconsin Belgian Red for me to throw back. The Wisconsin Belgian Red is a Belgian style sweet cherry lambic which comes in at a modest 4% ABV. The beer start out with a bit of tart cherry which completely transitions into a very bold, sweet cherry as you reach the middle of the taste with a very light mouthfeel before finishing crisp and sweet with more sugar and cherry. I swear this beer tastes like a cherry life saver in liquid form. I have paired a few milder cigars with Lambics in the past with great success and this was another stellar pairing. The beer brought more sweetness and fruit to the table without overpowering the subtle flavors the Quesada Seleccion Espana Beli-Lance had to offer. 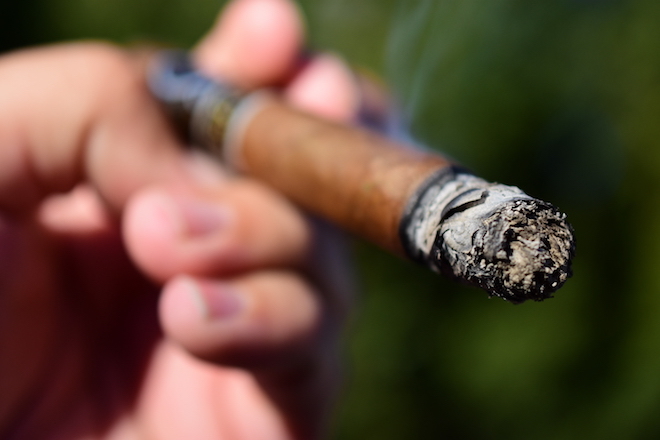 Tony, reading this review and my review of the H-Town lancero, it seems that the Espana line is a very consistent, as well as very enjoyable one. All the more reason to indulge.